Whether you want to study education, psychology, or another discipline at the bachelor’s level, you can add ‘assistant behavior analyst’ to your repertoire by completing the right series of courses and becoming certified. The Behavior Analyst Certification Board’s (BACB) Board Certified Assistant Behavior Analyst (BCaBA) credential is the standard for anybody looking to establish themselves in ABA, whether in the clinic or the classroom. It is an extremely marketable credential, and one that is usually required to land a job as a dedicated ABA assistant. Autism insurance mandate laws almost always state that only ABA services that are provided by board certified professionals are eligible for reimbursement. This makes hiring BCaBA-certified assistants an absolute imperative for ABA clinics in most cases. Ok – so what do you need to qualify for board certification? A bachelor’s degree in any discipline… along with ABA courses that meet board requirements… some pre-professional experience… and a passing score on the BCaBA exam. That’s it. And what’s the easiest way to make sure you take the right ABA courses? If you’re looking to enroll in a bachelor’s program, choose one that incorporates the BACB’s Verified Course Sequence (VCS). If you already hold a bachelor’s or are currently enrolled in a program that doesn’t include the right mix of ABA courses, then you’d just enroll in an independent course sequence to pound out the courses you need. To be clear, you can take ABA courses through a program that doesn’t have the BACB’s stamp of approval, but you’ll need to submit your syllabus and transcripts for review to make sure it passes muster – a nail biter that most people would like to avoid. Enrolling in a pre-approved bachelor’s program or stand-alone BCaBA course sequence simply takes the guesswork and stress out of meeting the education requirements to qualify for the BCaBA exam. Here we show all 57 schools in the US that currently offer the pre-approved BCaBA course sequence as part of a bachelor’s degree program (usually in psychology or education, or ABA specifically)… and those that offer stand alone course sequence options for people who already hold or are currently enrolled in a bachelor’s program. All schools hold regional or national accreditation through an agency recognized by the US Department of Education. All schools offer average annual undergraduate tuition rates in-line with the national average for public ($8,433) and private ($17,426) institutions adjusted for location. We’ve included a few key points so you can narrow down your options and find the program that meets your needs… and your budget. And to make it a little easier to find the program that works for you, we organized the list by state. What’s not to love about Troy University? After all, the Princeton Review named it the Best of the Southeast for 13 straight years, making it an obvious top contender for psychology undergrads. Psychology majors here have plenty of options for specializing their undergraduate major, including ABA. We are impressed with the solid reputation of the University of North Alabama in the field of ABA. The full-time faculty members here are experts in both applied and research fields of psychology with emphasis in ABA, as well as cognitive psychology, social psychology, and clinical psychology. There is a strong emphasis on research here that contributes to the body of knowledge related to applied psychology. We love the University of Alaska’s approach to designing degree programs. The university doesn’t prescribe specific courses for its students; instead, it is up to each student to determine an appropriate program within a predetermined framework. With the help of an academic advisor, students can fulfill the requirements for the program while still enjoying the flexibility of being able to take other courses that interest them. We love the Charter College of Education at California State University because of their commitment to producing educators who can transform public schools and community service agencies. Its collaboration with several public schools and educational agencies in the greater Los Angeles area has allowed countless students to become learner advocates who can improve the educational process of children of all ages. California State University’s hybrid ABA program provides an enviable location, less than a mile from picturesque Monterey Bay. We also like this program because it offers students the opportunity to complete some of their coursework through online study. We also love this school for its small class sizes and diverse student body. Students currently enrolled in a bachelor’s program in psychology or a related field can specialize their degree in behavior analysis by completing the certificate program in ABA at California State University Sacramento. This program is impressive because it provides undergraduate students the opportunity to work alongside faculty as they complete research projects and fieldwork experiences. In fact, each year about 300 students work with faculty on research projects in the Sacramento region. The completely online ABA course sequence is a great way for students to specialize an undergraduate program in behavior analysis, all from the comfort of their home. All the courses you need for BCBA certification in an affordable program available 100% online – what more could a post-bac student ask for? The University of Colorado Denver is the place to go for continuing education in ABA. The university offers the ABA program in a convenient, online format taught by UC Denver’s first rate ABA instructors. We also love the University of Colorado because of its affordable tuition rates. We are big fans of Eastern Connecticut University because of their many undergraduate research and creative activities available to students here. In fact, students here enjoy the opportunity to work closely with faculty mentors on an array of projects that contribute to the growing body of research in the field of applied behavior analysis. There’s plenty of reasons to love Western Connecticut State’s online ABA program, including its advanced virtual technology that turns the online learning process into an interactive experience that makes completing coursework both fun and flexible. Florida Tech offers the convenience of a 100% online program, but it’s also earned a reputation for its distinguished faculty and plenty of innovation. In addition, this university earned the honor of being recognized as a Tier 1 best National University by U.S. News and World Report and is ranked a Best Value College in Florida by PayScale’s College ROI Report. Florida International University is a sure bet for students currently enrolled in a bachelor program at FIU, and non-degree seeking students looking to take the BCaBA course sequence. This school has become known for its contribution to research, and the numbers speak for themselves: Currently, there are more than 4,000 undergraduate psychology majors here. We are always impressed with Purdue Global for their mastery of online education. While students enjoy the flexibility and convenience of distance-based study, they are afforded a dynamic learning experience complete with an innovative online learning platform that features live seminars and interactive discussion boards. We love the ABA offerings at Nova Southeastern University because they target both education and psychology undergraduate students. While the ABA coursework in the BS in Education program is available completely online, the BS in Psychology is offered on campus and is focused on the development of scientific literacy and strong analytic skills. Many students of this program are able to work on research teams and complete research projects under the direction of faculty members. We love the University of Florida because all full-time undergraduate students here can complete the ABA course sequence, regardless of their major. Plus, students with a bachelor’s degree from another institution can apply for the stand-alone course sequence as non-degree seeking students. We love the excellent research facilities here, including the Psychological Services center and the Center for Autism and Related Disabilities. Plus, the university has cooperative research arrangements with the Dade County Public Schools, as well as private schools and preschools in the area. 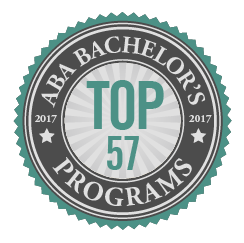 The University of North Florida always earns a spot on our best bachelor’s ABA programs list, largely due to its recognition as a quality higher education institution. For example, U.S. News & World Report ranked it among its best online programs in 2017. It also ranked the university among the Top 50 colleges and universities in the country for “Best Online Bachelor’s Programs,” among more than 1,300 distance-education degree programs nationwide. We love the University of South Florida for the support they provide undergraduate students working toward BCaBA certification. Some of the services they provide include ABA certification preparation, preparation for graduate work in ABA (if desired), and career assistance. The University of West Florida provides students with a convenient and flexible online ABA course sequence. Online learning is complemented with weekly virtual interactive online class meetings that can be attended live, or viewed later on as a digital recording to accommodate the schedules of busy students. There’s a number of reasons we’re big fans of Georgia Southern University’s ABA minor, not least of which is because it can be added to any bachelor’s program at the school. But since we’re dealing only with programs that meet the requirements for BCaBA certification, then you’ll be taking it as part of Georgia Southern’s esteemed psychology bachelor’s program. With the BACB’s Verified Course Sequence, you can be completely sure you’re meeting all the curriculum requirements for certification while attending a school with one of the best names in higher education in the state. If you live near Berry College, it pays to take advantage of their unique internship placement opportunities, which include the Marcus Autism Center. Students can complete internships in areas like language and learning acquisition, severe behavior disorders, and feeding disorders, among others. The hybrid program offered through the University of Hawaii Manoa offers students online courses that are complemented by two face-to-face meetings each semester. The online courses of this program may also include synchronous class sessions in the evenings. We are also impressed with the the fact that this program accommodates out-of-state students by allowing the in-person meetings to be done online. Southern Illinois is a leader in ABA – after all, it was home to the first behavior analysis master’s degree program in the world. SIU hasn’t stopped innovating since, and now offers an undergrad program that combines ABA and therapy – there is only one other program of this kind in the entire country. Students of this program have the opportunity to work with individuals with intellectual disabilities, traumatic brain injuries, autism, and more. We especially like Ball State University because of the innovative degree program pacing option it offers. Ball State’s ‘Degree in 3 Program’ caters to the time- and money-conscious student by allowing them to complete their undergraduate studies in just three years. The University of Kansas’ Department of Applied Behavioral Science is robust, including 19 faculty members, another 11 faculty positions, and 62 adjunct and courtesy faculty members. Undergraduate students in this department can choose from 6 specialty areas, including Adults with Disabilities, Basic Research and Conceptual Foundations (with options in either), Community Health and Development, Early Childhood (with options in education and intervention, autism, and research), Organizational Behavioral Management Research and Practice, and Youth Development and Juvenile Justice. MCLA is a leader in behavior analysis, offering three intensive, specialized minors that prepare students for BCaBA certification and for careers that involve applying the principles of behavior analysis in a variety of settings. Plus, if you get departmental approval, you can spend a semester studying at the New England Center for Children, a world-renowned research and treatment facility for autism and related developmental disabilities located in Southborough, MA. We love the psychology major at Northeastern University because of its many coursework specialization options, including ABA. Students of this major also have the opportunity to make real contributions to the growing body of ABA research by participating in projects alongside faculty. If you want to study ABA at Salem, you’ll enjoy being part of one of the largest public institutions in Massachusetts. If its convenient location just 15 miles from Boston isn’t quite convenient enough, you also have the option of taking the program online. If you want a convenient, online ABA program that can be completed in just two semesters, UMass Lowell is a smart choice, as all four courses of this ABA sequence are offered every semester (Fall, Spring, and Summer). Coursework can be applied to the master’s in autism studies or master’s in curriculum and instruction with autism option also available through UMass. There are plenty of good reasons why studying at Central Michigan University is a smart choice—namely because it has a long history of academic excellence. This university is among the nation’s 100 largest public universities, serving more than 20,000 students at its Mount Pleasant campus, in addition to 7,000 others enrolled online or attending courses at its more than 40 locations throughout North America. We are impressed with Oakland University’s take on distance education. While flexible, distance-based courses provide the best in convenience, internships and research opportunities make this an exceptionally well-rounded program. Internship opportunities in the community are plentiful, as this university is located in the heart of Oakland County’s Automation Alley. Wayne State University’s ABA course sequence trains practitioners in ABA with a focus on treating autism. We love this program because of the cohort model, which includes a combination of supported and independent learning through hands-on and classroom-based instruction. This program emphasizes the importance of intensive learning and collaborative, lifelong learning. Western Michigan University is one of our favorites for offering up a psychology undergraduate program that meets the course requirements for BCaBA certification designed to allow graduates to seamlessly transition to a master’s program in psychology or related areas. And you know what that means – with a master’s through WMU, you could then meet the requirements for BCBA certification. Saint Cloud State University is a great school for psychology undergrads. A combination of class, laboratory, and field work allow students to develop the kind of critical thinking and research skills that will serve them well in a variety of fields, including ABA. Plus, students here are well-prepared to continue their graduate studies in psychology and related fields. Undergraduate students at CMU who major in behavior analysis enjoy working alongside faculty who actively work in the field. This fully online program provides plenty of opportunities for faculty interaction, thereby providing students with the convenience of online study along with the unique opportunities usually only available to students of on-campus programs. The UCM Department of Psychological Science provides unique opportunities for undergraduate students to get involved with research. In fact, as a psychology undergraduate major, you have the option to author or co-author conference presentations and publications with faculty members. For example, students can engage in research at the university’s Behavioral Science Research Laboratory with presentations at national conventions. Students have also earned awards at Great Plains Psychology Conference for Behavior Analysis and Therapy projects. Students graduating with BAT training have excellent chances of being admitted to the UCM Master of Science in Behavior Analysis and Therapy program and other ABA programs nationally. We are impressed with Montana State University’s wide online offerings, which include more than 200 online courses. The ABA course sequence is also offered online for the best in convenience and flexibility, with all instructors here having documented expertise or certification in ABA. If you’re located in Nebraska and want to study ABA, you’re in luck thanks to Midland University. Midland’s bachelor’s in Psychology with an ABA minor is the only program in the state that offers the BACB Verified Course Sequence you’ll need to be eligible for the BCaBA certification exam. The program also satisfies experience requirements with an Intensive Practicum Experience. If you’re accepted into the ABA minor, you may be able to complete a one-year internship at the Center for Autism Spectrum Disorders at the University of Nebraska Medical Center in Omaha. The University of Nevada, Reno offers the best in flexibility for students of ABA – no matter where they may be located in the world. The undergraduate course sequence in ABA is provided to students both on-campus and through off-campus sites around the globe. Georgian Court University offers one of our favorite programs for students who want to study psychology with an ABA focus. This university boasts an ABA Clinic, which provides services to children who are at-risk due to behavioral and/or academic difficulties. Students who choose to continue their study at the graduate level have the opportunity to work with co-directors at the ABA Clinic. We love Rowan University’s Center for Behavior Analysis because of its commitment to student support through peer advisement, tutoring, and for designing programs that focus on developing knowledge and skills applicable to real behavioral issues in the community and the nation. Binghamton University is a good choice if you want to explore experimental psychology—essential for postgraduate study in psychology and related areas. Students here have the opportunity to be active participants in ongoing research with faculty. A great example of this is the Institute for Child Development, located directly on the Binghamton University campus. We are fans of Long Island University because it provides students with plenty of options for specializing their psychology undergrad degrees, including general psychology, abnormal psychology, applied psychology, developmental psychology, social psychology, neuroscience and, of course, ABA. Students completing their undergraduate degree in psychology with an ABA emphasis through Oregon Tech have access to a number of benefits, including a Student Success Center, career services, and close faculty interaction. We also love this campus, located just a few miles from downtown Portland—the heart of the Silicon Forest. Carin University’s School of Education knows that ABA has become an essential component of special education. Undergraduate programs prepare students for teaching in public, private, Christian, and international schools. Cairn is a smart choice for students looking to spend plenty of time in classroom settings, observing, tutoring, and teaching. There are plenty of reasons why we like Saint Joseph’s University for their online undergraduate ABA studies, including one-on-one support from counselors, advisors, and professors, 24/7 technical support, and even assistance with the application process. Even as a top-name, world-renowned university, the University of Pittsburgh offers a low student-to-faculty ratio through its Greensburg campus, providing a level of student-centered learning that isn’t easy to come by. Students here enjoy plenty of experiential learning opportunities and personalized support. We love the fact that in addition to providing online ABA coursework, Clemson University created the Clemson University Youth Learning Institute Center for Behavior Analysis to provide ABA services in the community. Just some of the services provided here include everything from performance management consultancy to services designed to help marginalized populations. We love Lipscomb University for its reputation for being a leader and innovator in education in Tennessee and throughout the nation. If you’re an educator in Tennessee, you can enjoy a 26% in-service scholarship, and financial aid is available to many. Plus, the undergraduate ABA courses can be applied to an MS in ABA in the future. We love the University of Houston’s ABA programs because of the unique practicum and research experiences offered here, including amazing opportunities at UHCL’s Center for Autism and Developmental Disabilities. The UNT Department of Behavioral Analysis holds the distinction of being the nation’s first stand-alone department of behavior analysis. It also offered the first undergraduate degree in the field. Complete a post-baccalaureate certificate in ABA here and you’ll have access to a variety of research and field experiences at such places as the Denton State Supported Living Center, the Easter Seals of North Texas, and the UNT Kristin Farmer Autism Center. We recognize the University of Texas at San Antonio for its advancements in research. This university enjoys the distinction of being a Tier 1 Research Institution and is the largest university in the San Antonio metropolitan region. A school that creates a special education degree with a decided focus on autism shows that they have a real understanding of the modern special ed landscape – and UVU has done just that. In addition to the Professional Special Education Teacher Education Program, UVU also makes the BCaBA course sequence available as a stand-alone program for those who already hold a bachelor’s degree. If you are a resident of Virginia – or even if you’re not – George Mason University is a smart choice for studying ABA, as it is Virginia’s largest public research university. More than 34,000 students from all 50 states and more than 120 countries come here to study alongside the university’s distinguished community of scholars. We like Mary Baldwin’s BCaBA course sequence because the university also helps students arrange the field placements they need to begin gaining the experience required to qualify for certification. If you choose to complete this four-course sequence, you can be guaranteed additional help for satisfying the field experience requirements. We are always impressed with the multiple opportunities available to undergrad psychology majors at WVU. For example, the Department of Psychology’s Life Sciences Building includes animal and research labs, testing and observation centers, computer labs, and the Quin Curtis Center, which provides outpatient mental health services for the local community and services as a training facility for students in clinical psychology. Note: Student-to-faculty ratios shown are institution-wide and not specific to the featured program. Tuition and related fees do not take into account any type of financial aid assistance you may qualify for, and books and related expenses are not included in the total. In instances where ABA was offered as a specialized track within another major, the institution provides the total number of graduates within that major.